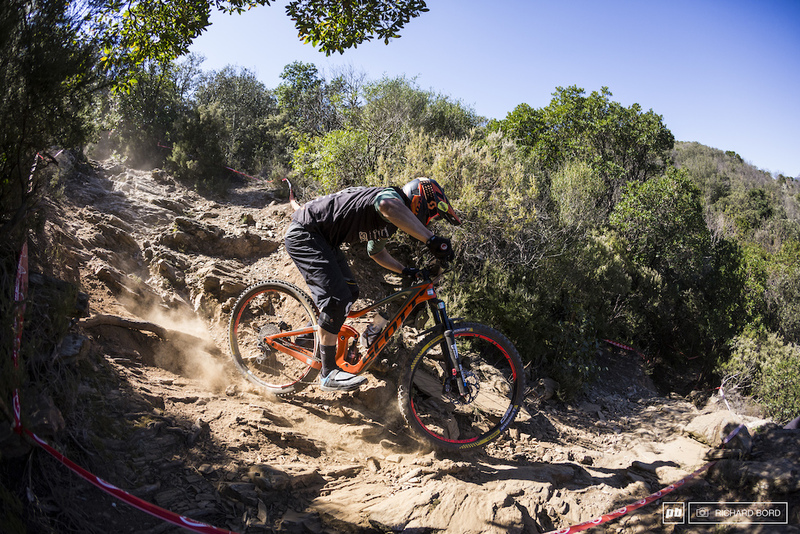 While the EWS started the season in New Zealand this weekend, the French Enduro Cup also kicked off 2019 with the first venue in Olargues, in the South of France. 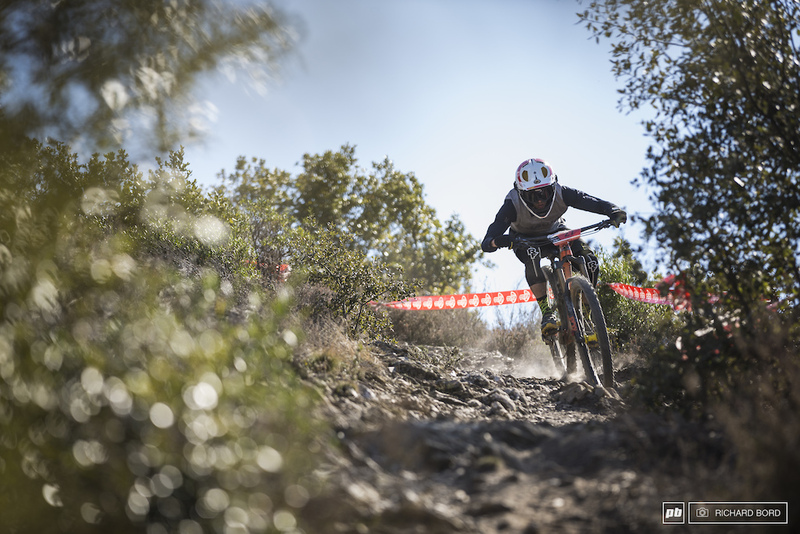 Some of you may remember that it was cloudy and rainy last year here for the EWS race, but this time it was all about dust and spring temperatures. 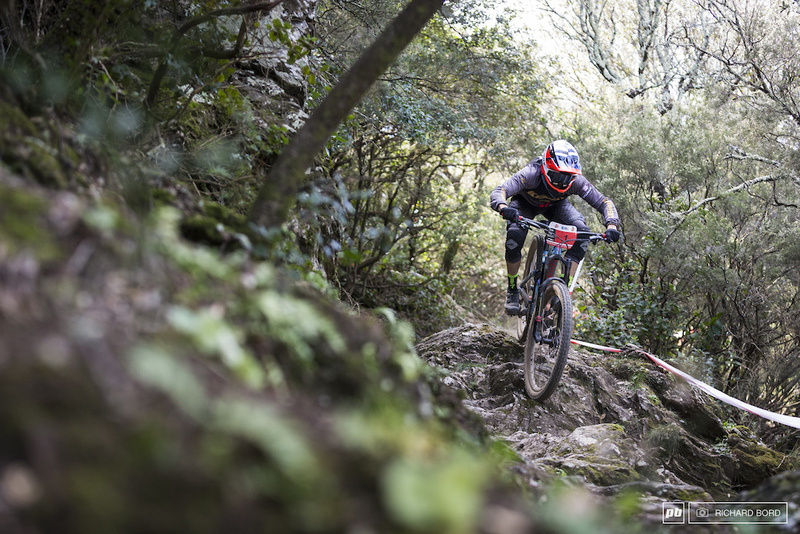 With a total distance of 77 Km (47.7 Miles) during the 2 days race, 3950 m down (12950 feet) and 3100 m up (10170 feet) it was a difficult start the season for the 250 + riders, amateurs and pros. 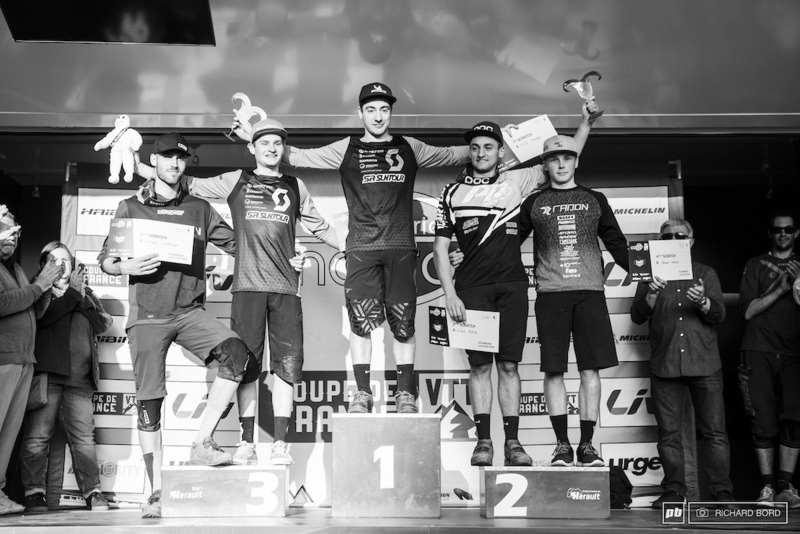 Elliot Trabac, who already won a local race few days before, showed the other guys he had a good winter of training by winning this first French Cup with a total of 4 stages wins over 6 stages throughout the weekend. 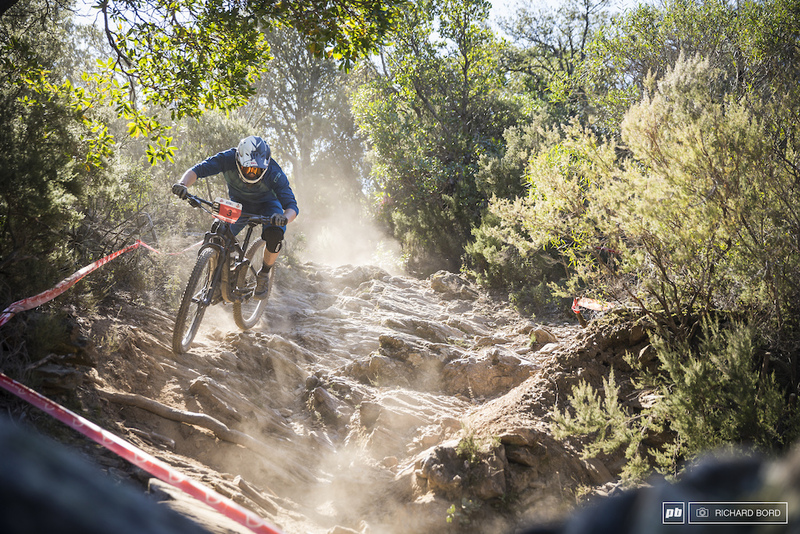 A good start for a big season ahead as he should compete in all the EWS after the Tasmania venue plus the other French Cups and some other races. On the women's side, Melanie Pugin took 1st place. 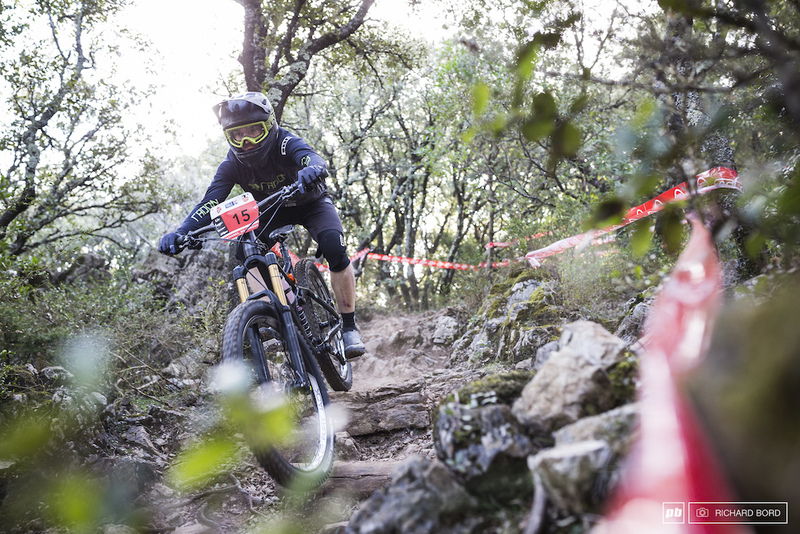 Despite third place on Saturday, she managed to be faster on Sunday to pass Estelle Charles, 2nd, who had a pedal problem at the end of the weekend. 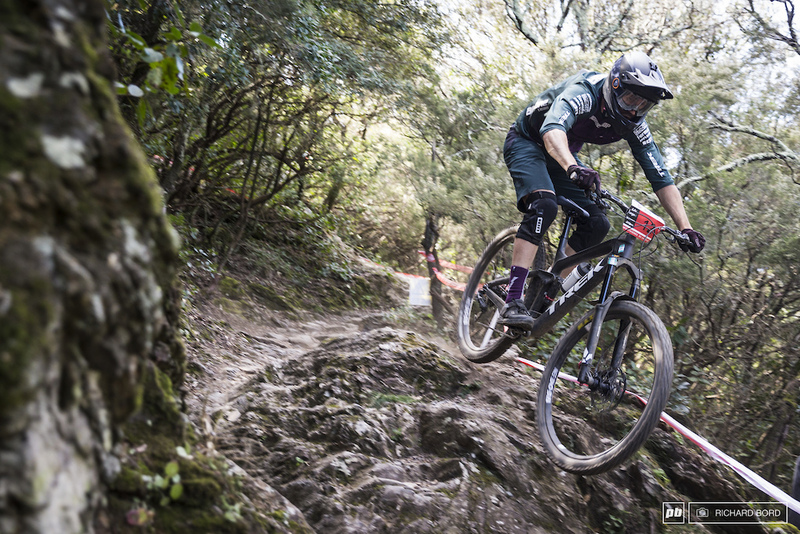 Eliott Baud (2nd) and Elliot Trabac’s teammate Hugo Pigeon (3rd) stayed in the same positions during all the weekend but the war was more open right behind them and Clement Charles finally took the 4th place in front of Arnaud Garanger. 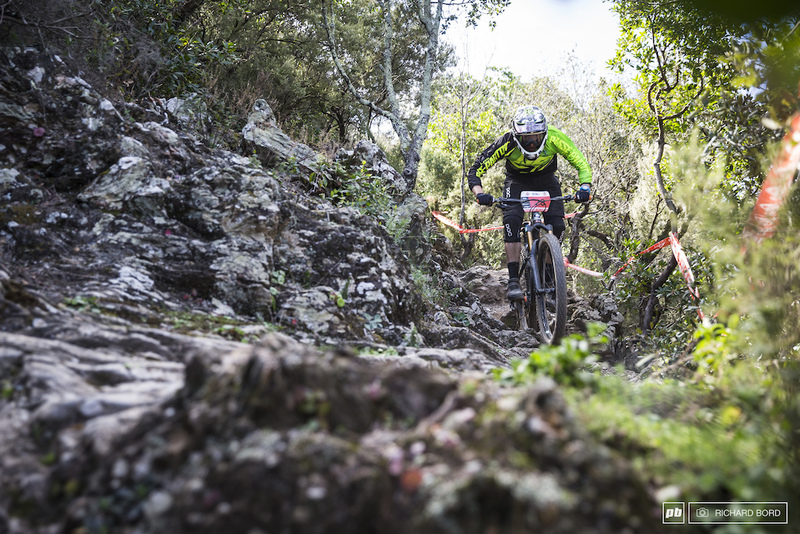 Winner of the 2018 French Cup, Ludovic Oget, was a bit out of the rhythm as he took the 14th place just behind Levy Baptista who was 2nd last year. 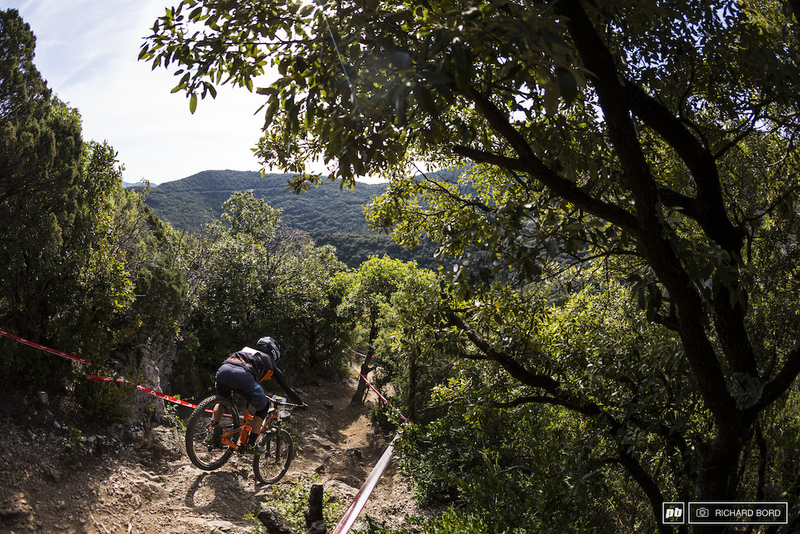 Riders will have time to train until the next race of the French Cup which will take place in Val d’Allos on 22nd and 23rd of June. 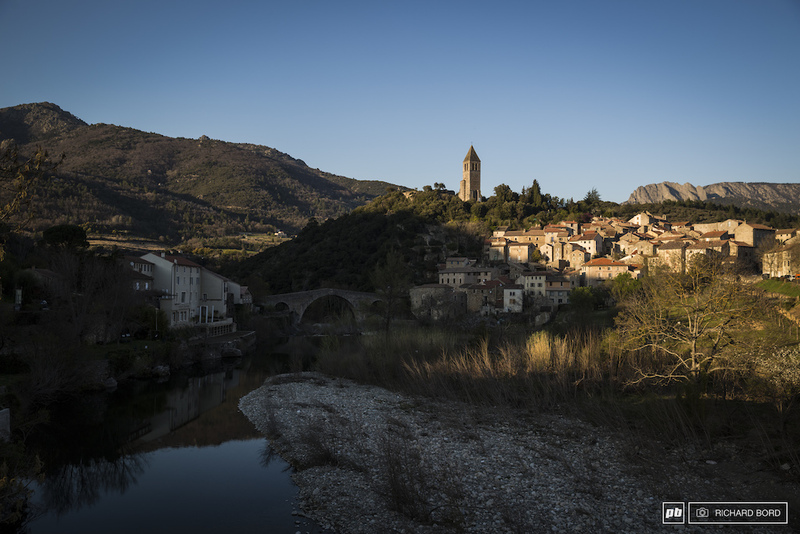 Minutes before the sunset, a classic postcard of Olargues where the Jaur river is passing. 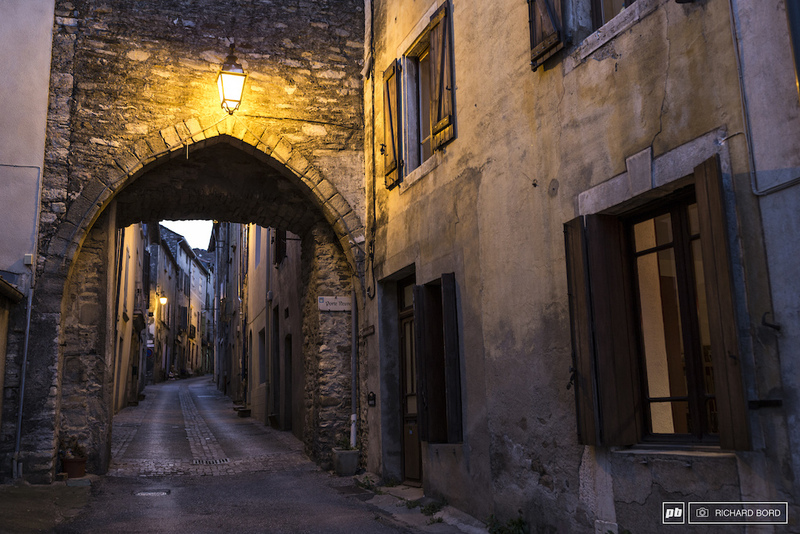 One of the old streets of Olargues. 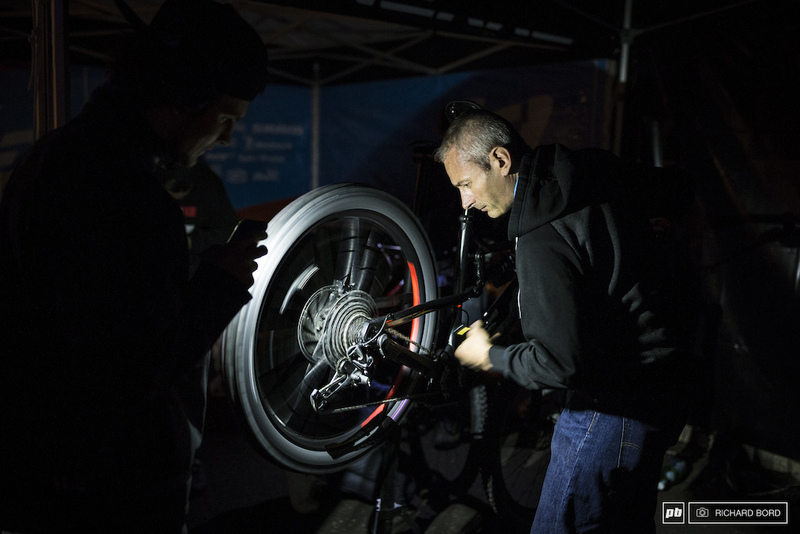 Most people arrived late on Friday night after a day at work and did late night mechanics before the race! 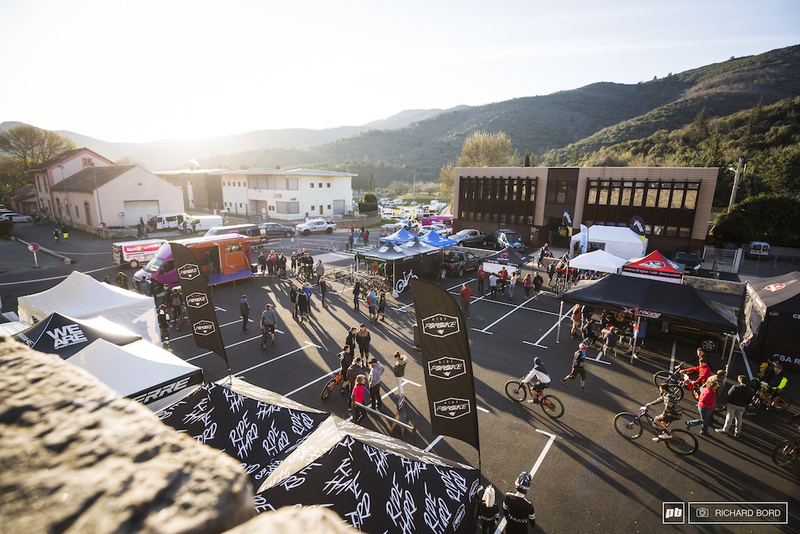 Fresh early Saturday morning while the sun rises and riders arrive to the pits before going up to the Col de Bacoulette by car where all the stages start. 1st place woman Melanie Pugin in the technical part of Stage 1. 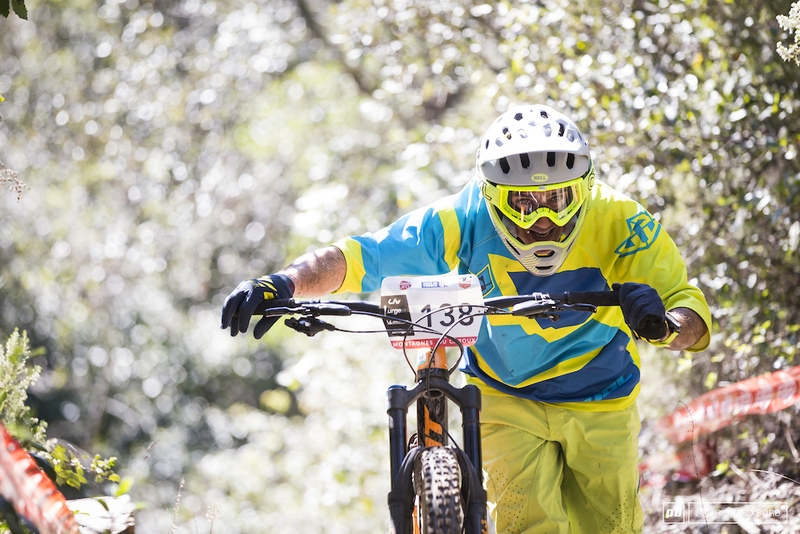 4th place Clement Charles had a consistent weekend on his Radon bike. 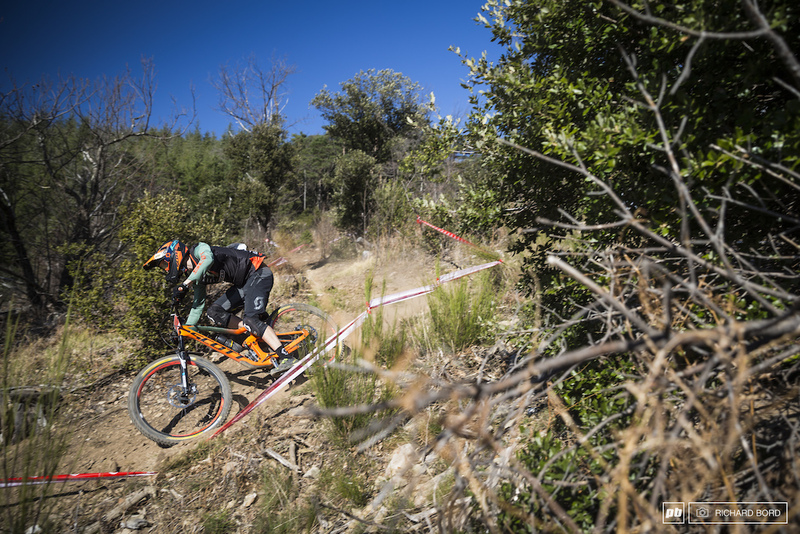 2018 French Enduro Series winner Ludovic Oget was a bit off the rhythm this weekend with a 14th place. 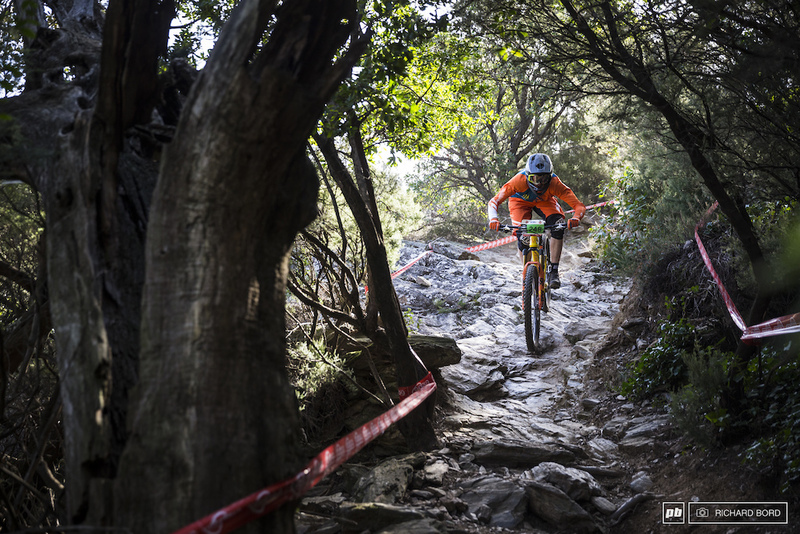 Junior Thomas Lempernesse trying to keep things smooth in the rocky Stage 2. 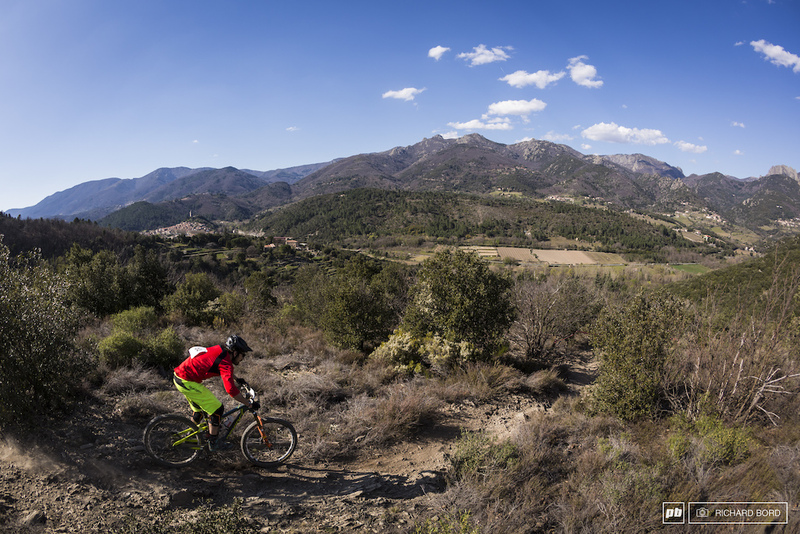 Surrounded by mountains, Olargues is part of the Regional Natural Parc of Haut-Languedoc. 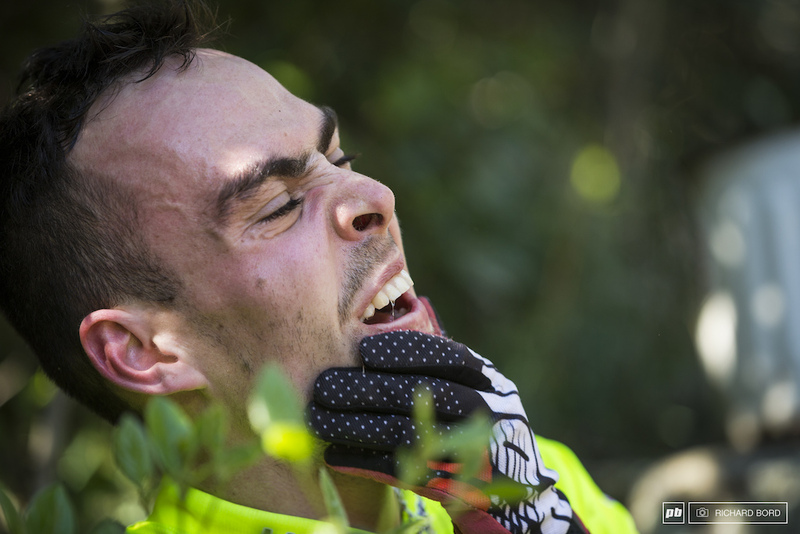 With a start every 10 seconds, this is what happens when some riders are faster than others. 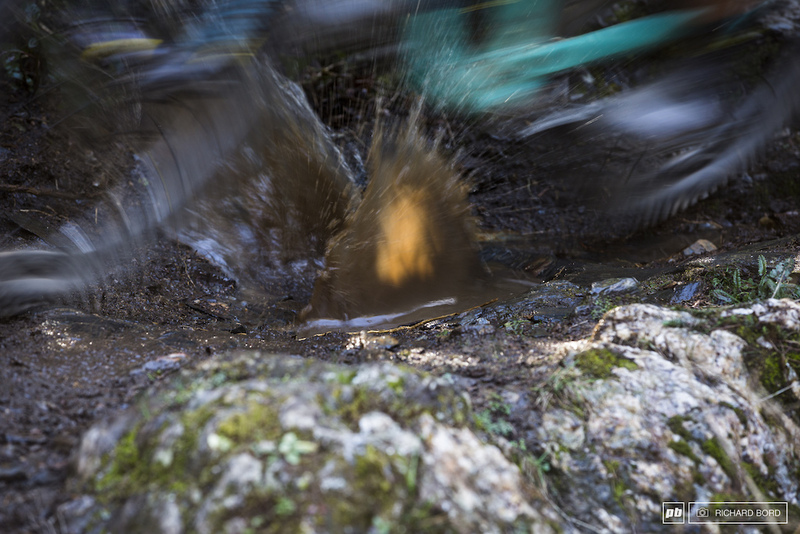 This puddle was maybe the only non-dry part of the weekend. 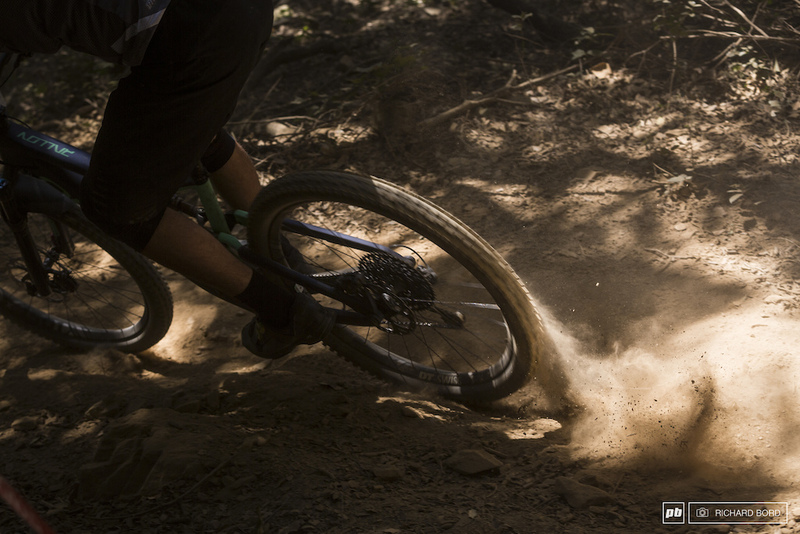 This weekend was all about dust and rocks. Did I mention most parts of the stages were steep? 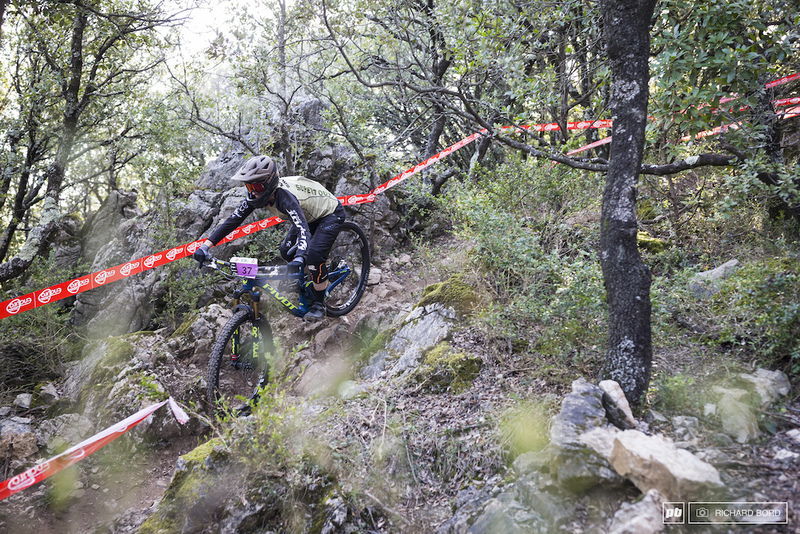 5th place Arnaud Garanger charging on Stage 2. 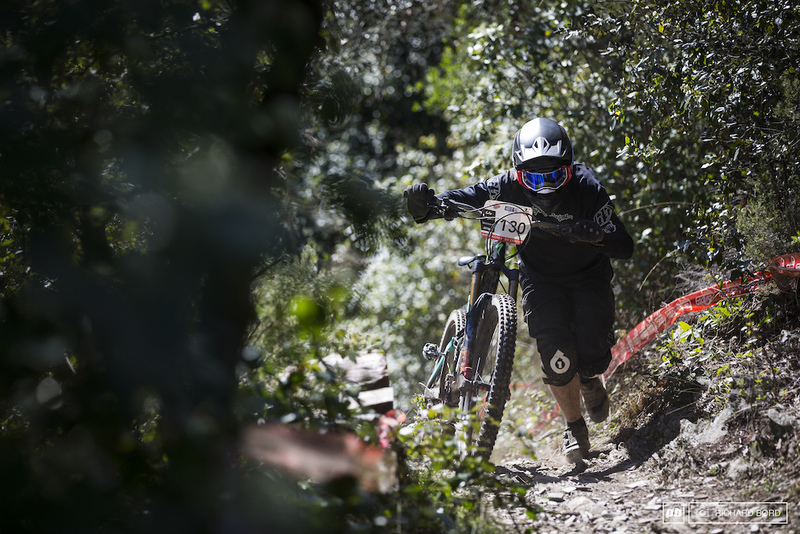 2nd place Eliott Baud had a consistent weekend between the two Scott guys. 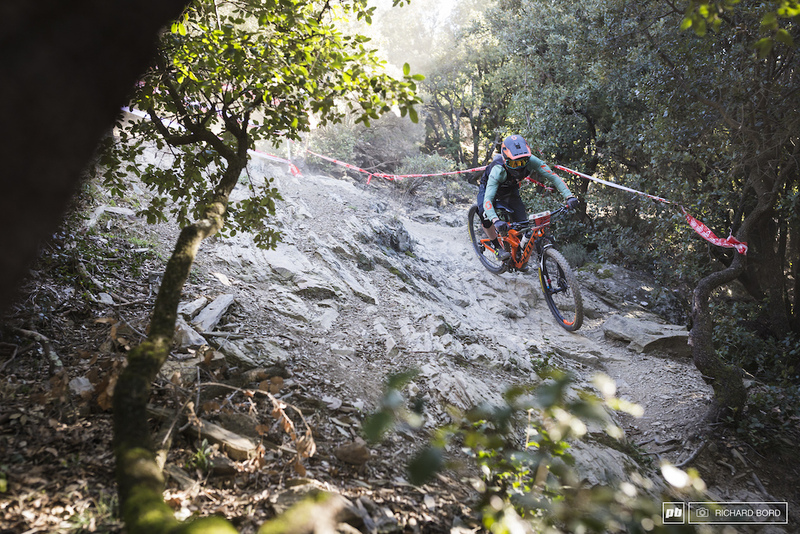 Hugo Pigeon makes his entrance to the steep and technical part on Stage 4. 5th place in Master 1 category David Metche knows photographers like colors. Surprise at the end of stage 2 with a last climb that most exhausted riders decided to walk up. 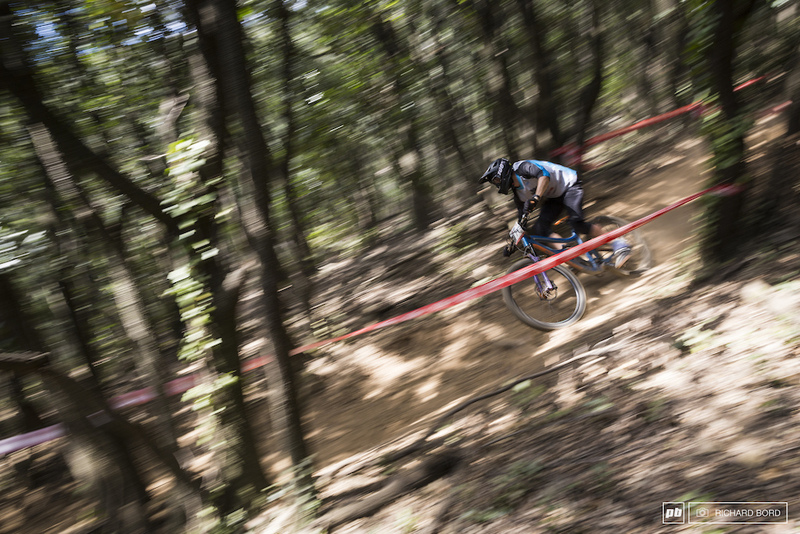 Stage 3 on Saturday was as long as dusty. 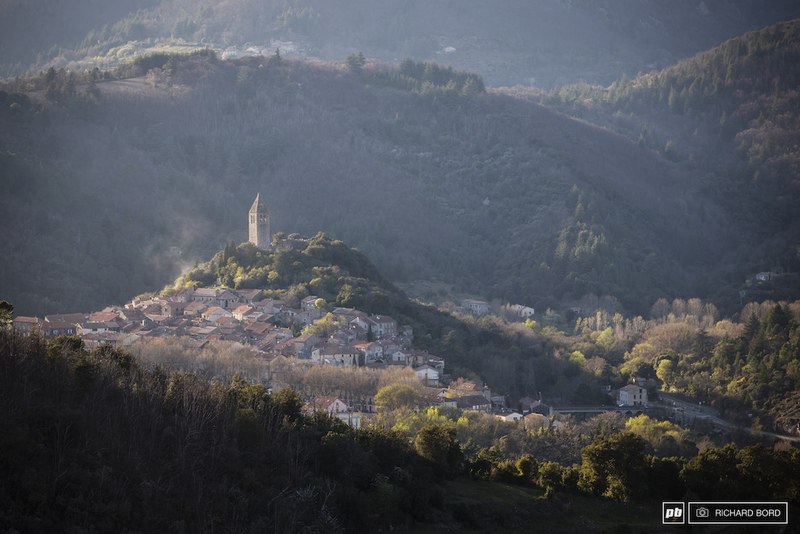 The view was amazing but riders didn't have time to see it as it was a "blind stage"
Juniors slaloming between trees in Stage 3. Remember that they don't move if you touch them! Hundreds of riders waiting for the start of Stage 4. 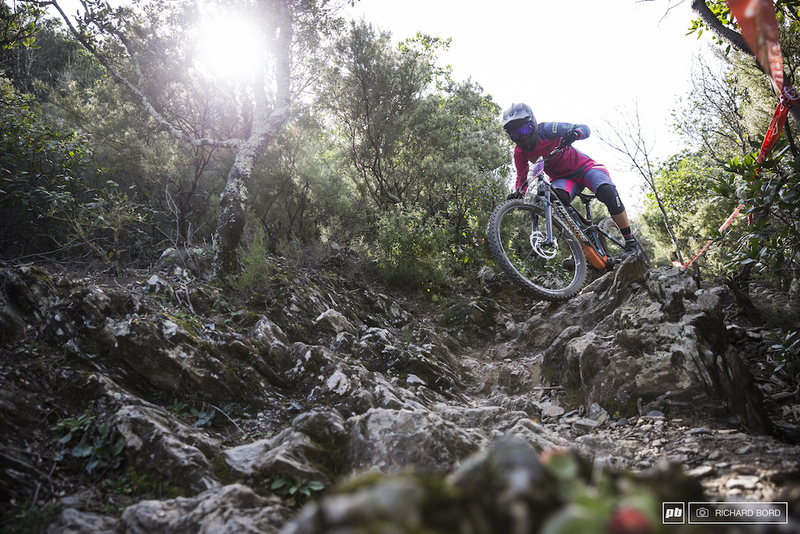 3rd place Laura Charles on top of the rocks in Stage 2. 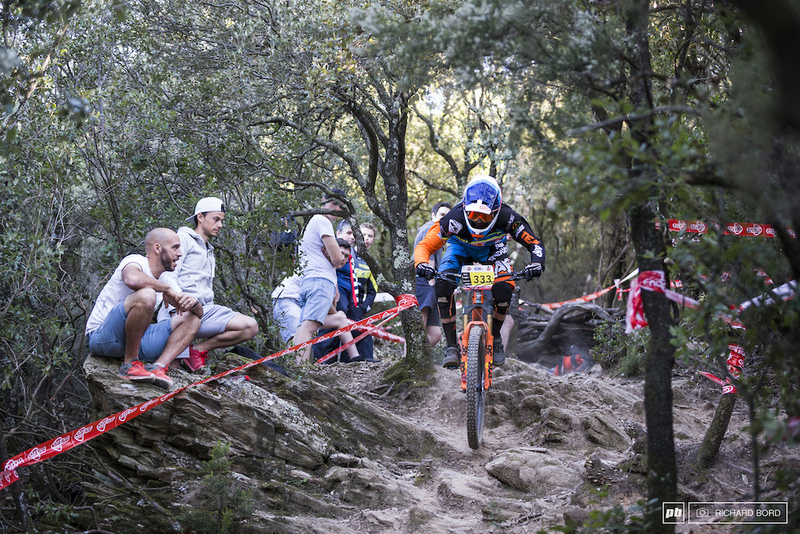 Remy Absalon was here to bring his teammates on the box and to have good times on the bike. The full mission is a success! 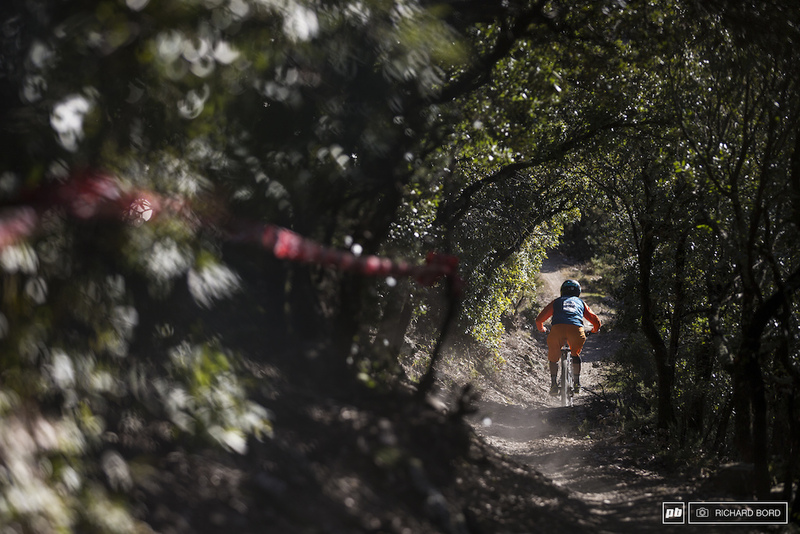 A nice and fast tunnel under the trees on Stage 4. 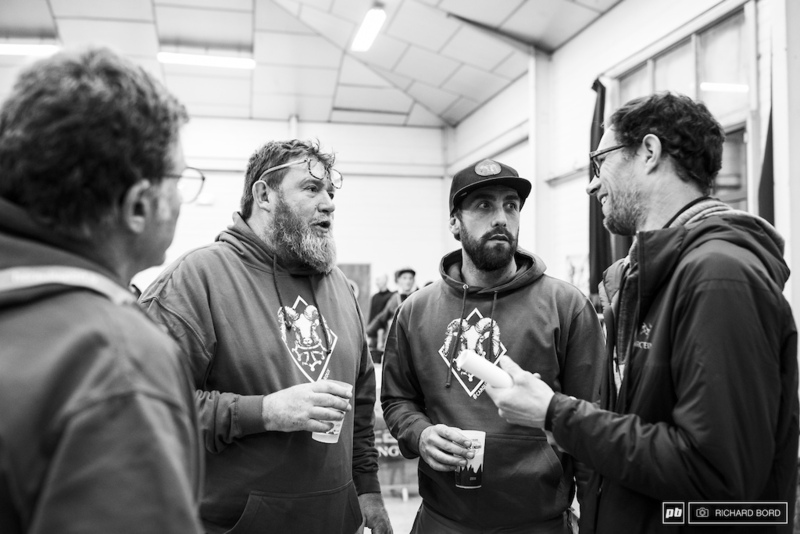 3rd place in 2018, Louis Jeandel made it to the 7th spot this weekend. 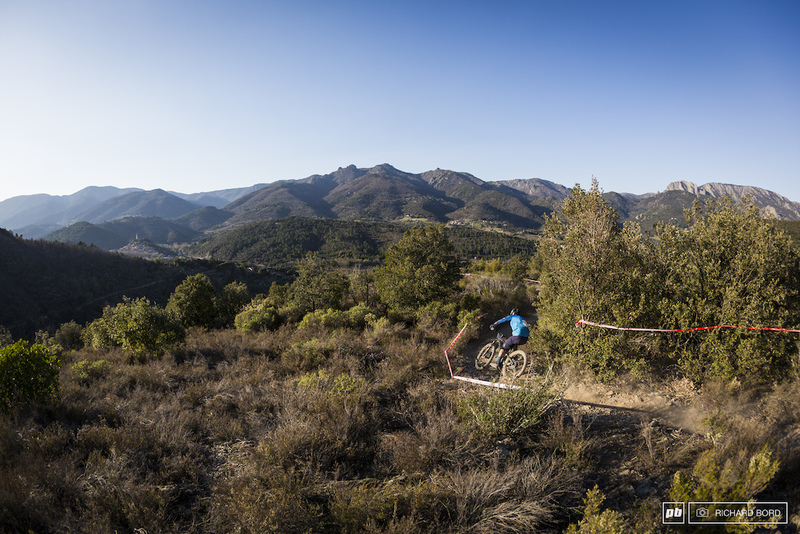 10th place Alexis Chenevier in the last part of Stage 6 on Sunday. 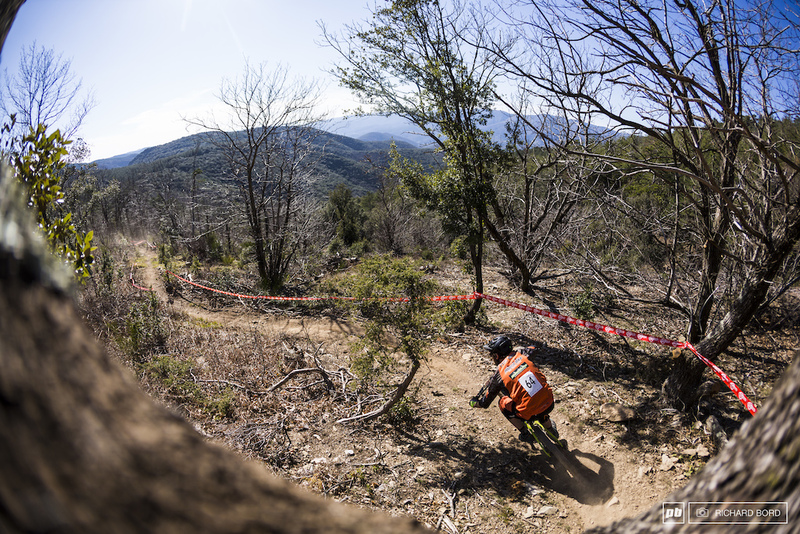 Stage 4 on Sunday had a lot of steep and dusty turns in the forest. Not a bad view with Olargues far on the left side. 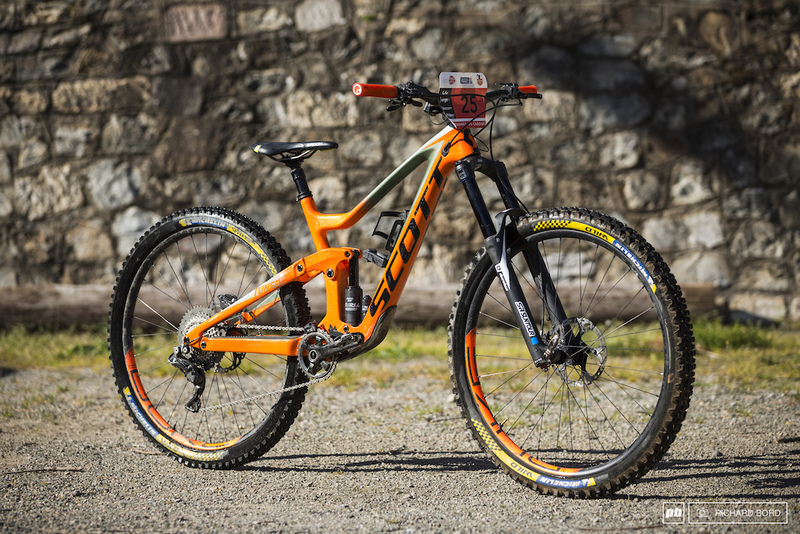 The 170mm Scott Ransom is the new weapon of the Remy Absalon's team. Here is Hugo Pigeon's with SR Suntour suspension. 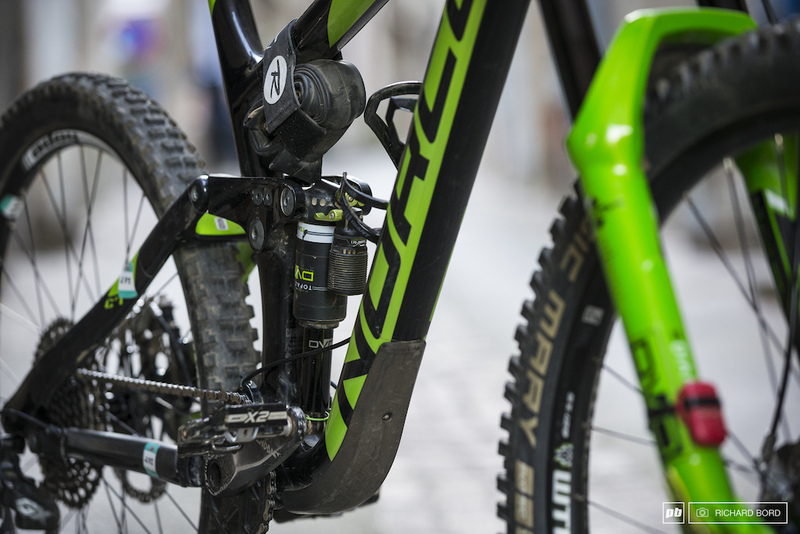 Shimano XTR Di II and a one block 50mm stem and 750mm bar. 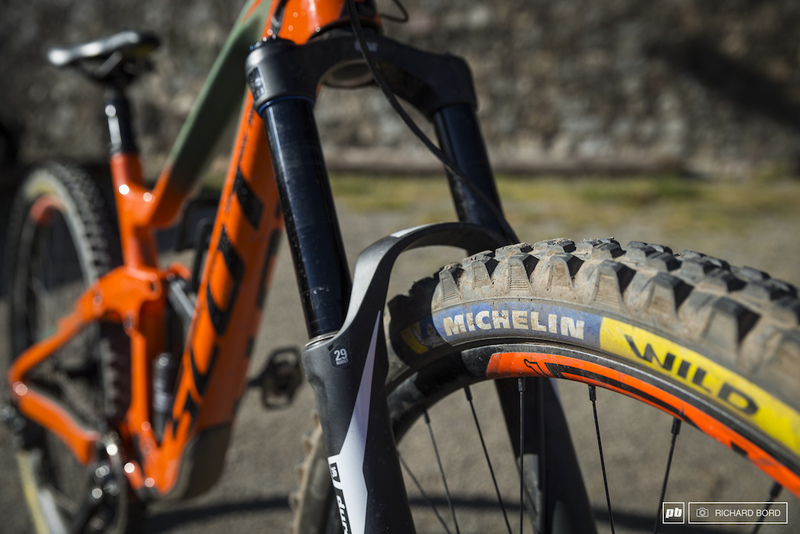 The new Michelin Wild 29'' with a DH structure and a very smooth rubber. 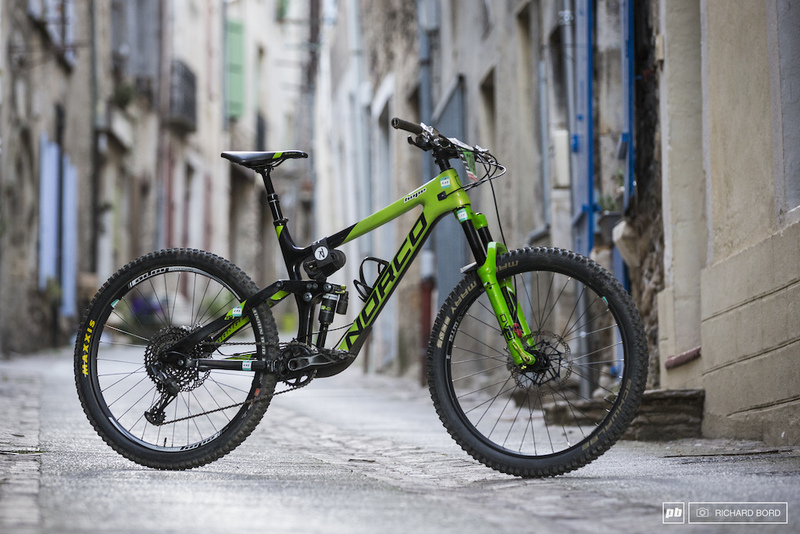 Matheo Grandjean is a Junior privateer who owns this Norco Range C3 with DVO suspensions. We also like the tires choice with a Schwalbe Magic Mary in the front and a Maxxis Minion DHR in the rear. 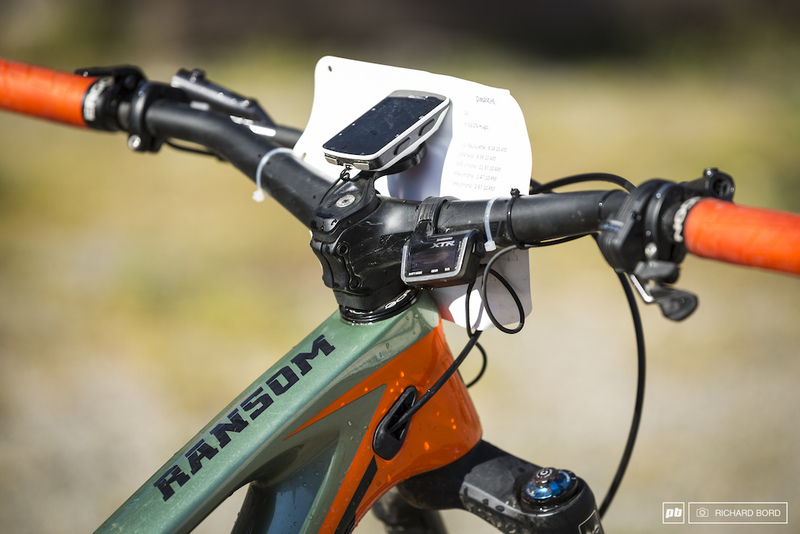 This Norco is full DVO equipped with a Topaz in the rear and a Dimond on the front. 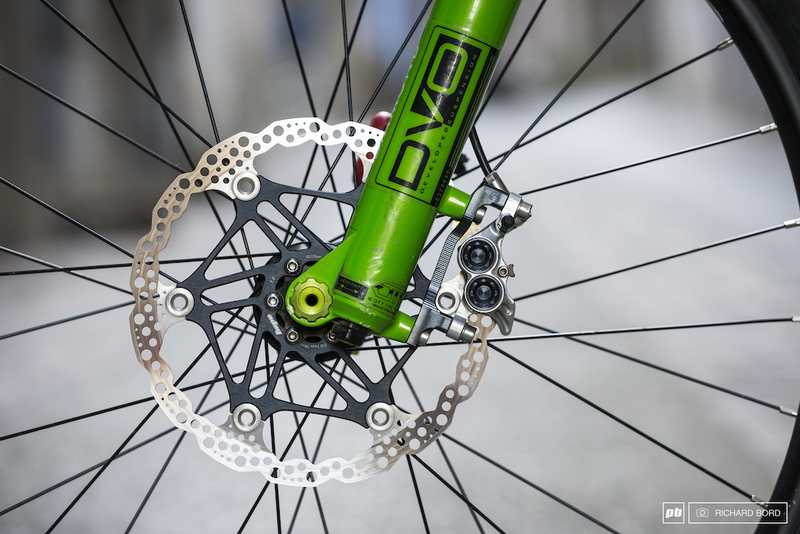 DVO Diamond + Hope Tech 3 with a 203mm disk = a downhill ready enduro bike. And this is why the French are such a force to be reckoned with in gravity events. Those tracks are steep and nasty. Not a place for down country bikes at all. Absolutly !!! Roche roche and more roche. 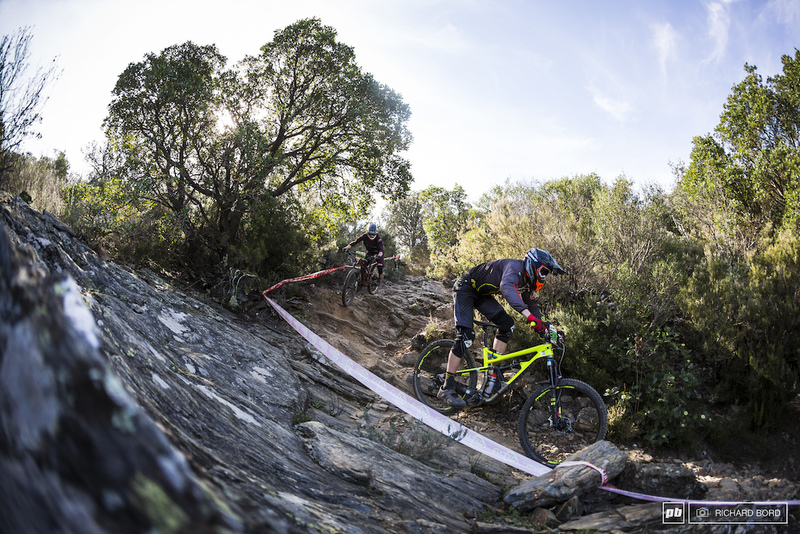 That is a buffet of rocks and technical steep terrain, those trails look great, EWS worthy. @fedfox: That place is ridiculous, I was at the EWS there last year but dislocated my shoulder early on in practice, I did however get to ride what was stage 7 of that race and it was pretty deadly mix terrifyingly steep rocky chutes and flat rocky traverse pedal sections that got you nice and tired for the next chute. I was almost glad I didn't have to race once I saw the rain come down! 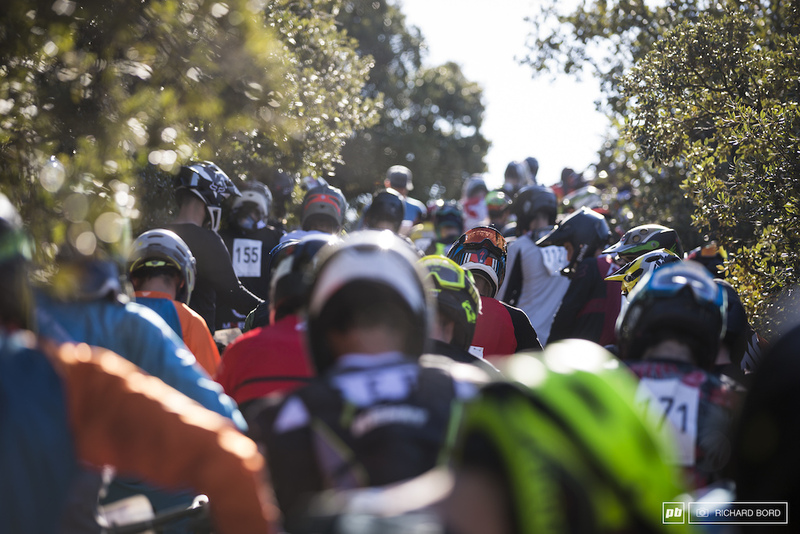 "Hundreds of riders waiting for the start of Stage 4." 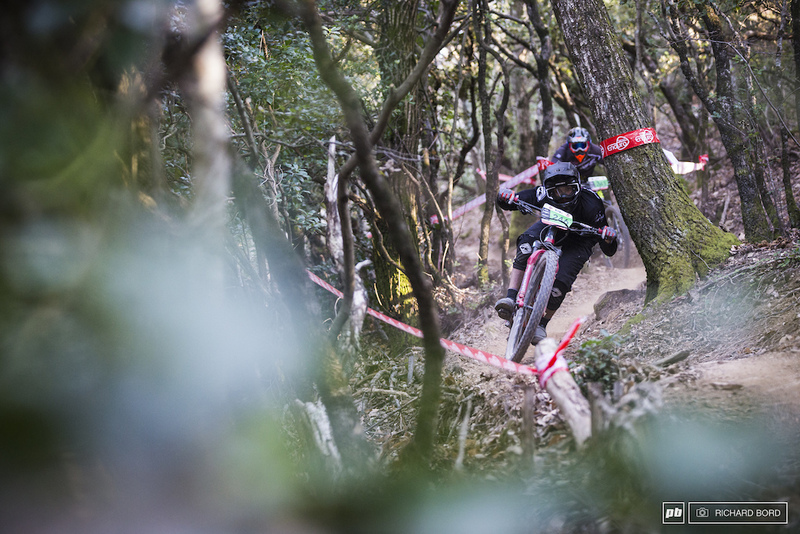 and "Juniors slaloming between trees in Stage 3. Remember that they don't move if you touch them!" If I remember well, that "interesting" Norco is a normal model sold in Europe last year? 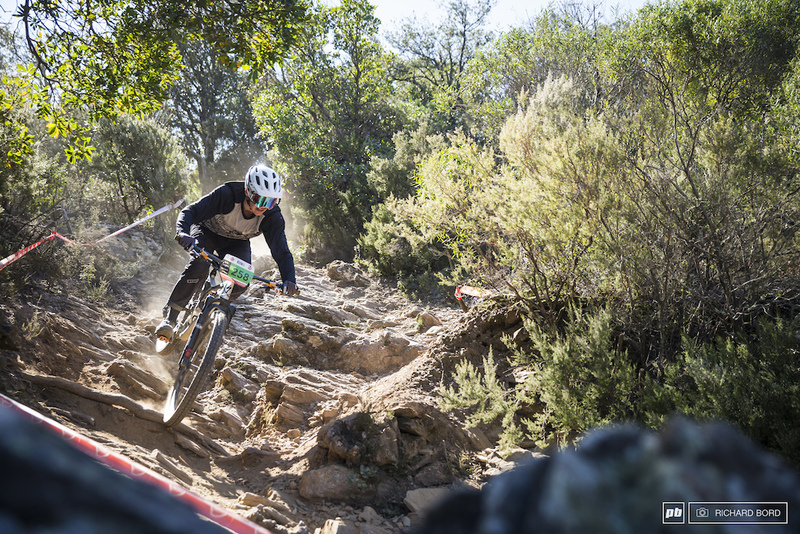 I wonder if those Michelin tyres really exist in 29er. It must be 8 months I try to purchase them but can’t find them anywhere! I see french lines everywhere! 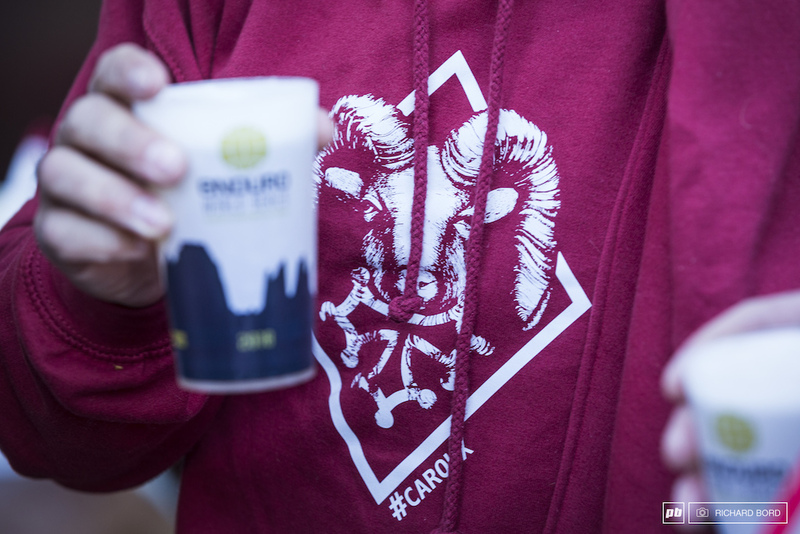 Come to the Radon Epic Enduro on april 21 14 stages 4500meters up and down 110km that is real enduro. Why does that DVO Topaz has the "token" strips outside the shock? The track looks rad. Rocky and technical.